As NBC promoted this week's interview with Snowden with Brian Williams, they emphasized how secretive their operation had been in order to secure the interview. Within hours of NBC’s interview preview, Secretary of State John Kerry urged Snowden to “man up” to face the music back in the U.S. When asked about returning to the U.S., Snowden said he would obviously like to return to his family and his country but that his top priority is to see that the programs he helped expose would be reformed. Government reaction to Snowden’s interview continues. Politico reports that since the interview, the NSA has released the email Snowden sent to superiors about wrongdoing, which Snowden referenced in the NBC interview. The email released by the NSA in wake of the interview is not on par with correspondence Snowden described when he sat down with Brian Williams. Snowden and others contend the NSA cannot be trusted to be providing the public the full story given their past statements and interest in misrepresenting Snowden's actions. 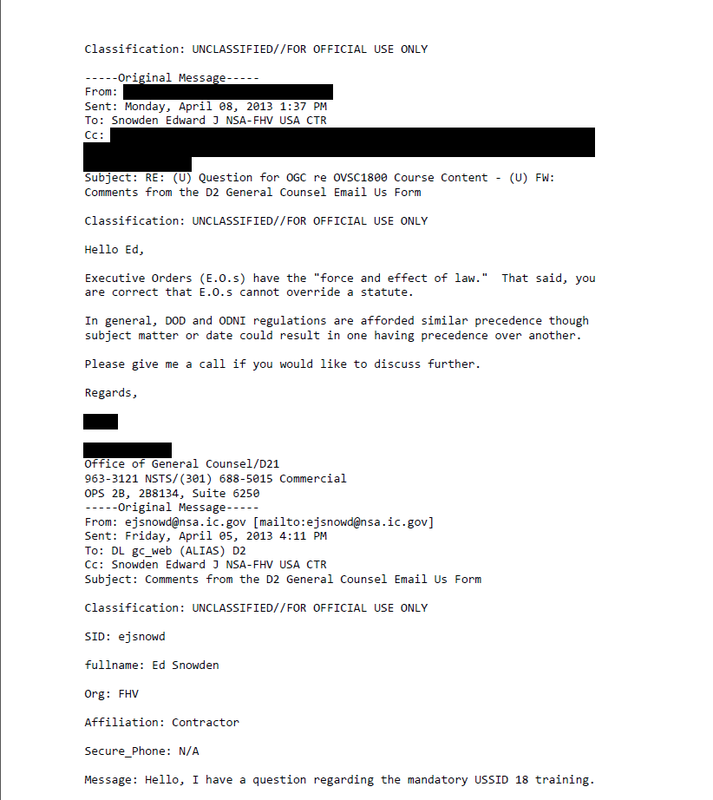 Screenshot of the email Snowden sent to superiors at NSA in April 2013, as released by the NSA on May 29, 2014 in wake of Snowden's interview with NBC's Brian Williams on May 28, 2014. “Today's release is incomplete, and does not include my correspondence with the Signals Intelligence Directorate's Office of Compliance, which believed that a classified executive order could take precedence over an act of Congress, contradicting what was just published. It also did not include concerns about how indefensible collection activities - such as breaking into the back-haul communications of major U.S. Internet companies -- are sometimes concealed under E.O. 12333 to avoid Congressional reporting requirements and regulations. “If the White House is interested in the whole truth, rather than the NSA's clearly tailored and incomplete leak today for a political advantage, it will require the NSA to ask my former colleagues, management, and the senior leadership team about whether I, at any time, raised concerns about the NSA's improper and at times unconstitutional surveillance activities. It will not take long to receive an answer. What we haven’t seen from Snowden are the emails he references. If he collected thousands of documents from his time at the NSA, it remains to be seen why he does not seem to have collected correspondence he had with the NSA as he said he did. While it is reasonable for both parties, the NSA and Snowden, to stand behind their respective stories, it does not appear we have a clear sense of Snowden’s preemptive correspondence without he or the NSA taking steps to uncover additional emails. What do you all think about the information NSA shared and Snowden’s retort? 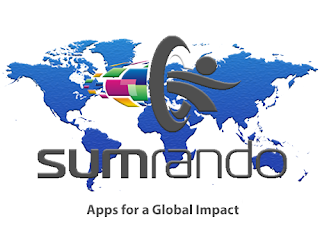 Comment below or tweet us @SumRando. On Wednesday, Edward Snowden sat down with NBC’s Brian Williams for an exclusive, hour-long interview from Moscow. It’s lost on no one that Snowden is one of the most celebrated and reviled figures in world news in the year since he helped break the story about the U.S.’s government’s vast and invasive surveillance activity. 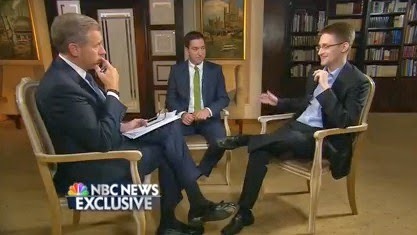 Prior to this NBC interview, Snowden had only appeared at a smattering of events from hotel rooms and “undisclosed locations.” After having seen Snowden only through these secondary screens, there was something powerful about seeing Snowden sitting across from NBC’s Williams and eventually next to Glenn Greenwald, the reporter at The Guardian that broke Snowden’s story. For even those who have followed Snowden this past year and the stories that have unfolded because of what he shared with journalists, this was a rare glimpse into the polarizing figure’s resolve. One of the most chilling moments of the interview came as Snowden explained the full extent of NSA’s power to monitor citizens. He said, ”The intelligence capabilities themselves are unregulated, uncontrolled, and dangerous. People at NSA can actually watch internet communications and see our thoughts form as we type. What's more shocking is the dirtiness of the targeting. It's the lack of respect for the public and for the intrusiveness of surveillance.” He described that NSA analysts can see how people’s thoughts “develop.” For instance, they can watch you draft an email, backspace, pause, and revise your communications. If Snowden’s allegations are accurate, the NSA could be watching over my shoulder as I type, edit, and publish this blog post to share with you all and over yours as you comment on this post or tweet the @SumRando account your feedback. To watch the entire interview, head over to NBC News where they are streaming the interview in multiple parts. One of the largest obstacles preventing potential users from utilizing a VPN is the simple act of adding an additional step. Is it really worth rushing online at the expense of exposing your personal, private information? It certainly doesn’t help when companies like Hulu, popular in part for their user-friendliness, provide yet another reason to throw safety to the wind. 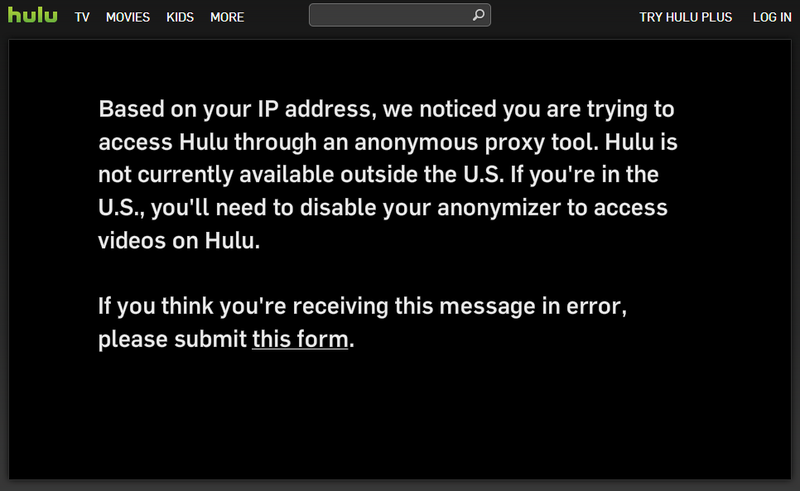 Recently Hulu started blocking VPN users out of what they call “piracy concerns.” Streaming services like Hulu have capitalized on the market because of their extensive content and ability to make viewing easy and relatively painless. saw the above message when trying to stream content. As TorrentFreak points out, services like Hulu have actually helped reduce piracy rates as users are given access to new content at a low subscription cost. Now they block access to VPN users because of licensing concerns, citing foreigners misrepresenting their origin. However, where does this leave valid U.S. users who employ a VPN as part of their daily online routine? Beyond this very straightforward argument lies another one that may have to be hashed amongst content providers and licensers. Shouldn’t valid account holders for services like Hulu be allowed access to streaming if they are traveling or temporarily residing abroad? Punishing frequent fliers doesn’t seem like a great business idea. Until popular content is made more widely available, it seems the take away message to legitimate users is that you need to choose between online security and this week’s episode of Vampire Diaries. This half-baked decision will have real consequences for cyber-aware users and it’s important for providers like Hulu to realize what they’re doing. This is another reason we need to #ResetTheNet: When haphazard decisions diminish our ability to live securely and privately online, it is to speak up and take action. SumRando is proud to stand behind the #ResetTheNet campaign to encourage responsible use of internet privacy and security tools among “everyday” internet users. It is worth noting that a number of VPNs are working with Hulu to create a work-around that allows valid Hulu users to remain connected to our services while enjoying streaming media, but the matter remains unresolved at the moment. Read more about the issue at TorrentFreak. This week, Russian President Vladimir Putin took a page from other world leaders who have recently targeted the Internet as a political punching bag on the heels of new restrictions passed by the Russian parliament. The law requires social media websites to maintain servers within Russia and save information about its users. In his widely-publicized remarks, Putin pointed to the potential harm of Internet companies like Yandex (Russia's top search engine) and others who do not exhibit faithfulness to Russian security and business interests. Among his most pointed claims, Putin suggested that Russia must go to great lengths to protect itself on the Internet since, as he put it, the Internet was originally a "CIA project" that is "still developing as such." Russia's technology sector and other pro-democracy voices are rightfully speaking out in anger about the new efforts to limit internet freedom. The restrictions, building on the fact that pro-Putin businessmen now control Russia's largest social media platform Vkontakte, suggest that Putin's recent efforts to build nationalistic support for the Kremlin's political efforts will expand more formally into the cyber sector. The three bills impose strict control over disseminating information on the Internet and online payments, and toughen punishment for terrorism and extremism. The one that sparked the most concern effectively equates popular bloggers with media outlets, subjecting them to substantially greater regulation and legal liability. The bill would require bloggers with 3,000 or more page-views a day to reveal their identities, fact-check their content, not disseminate extremist information or information violating privacy of citizens, and abide by the rules of pre-election silence. Human-rights activists say bloggers are ill-equipped to fulfill such demands. Failure to comply would be punished by fines and possibly blocking. Social-networking sites, blog hosts and other "organizers of disseminating of information on the Internet" may also be affected, as the bill requires them to store data on popular users' activity online for six months for potential use in police and other official investigations. Read more about the new laws and how this could impact the internet landscape in Russia and beyond.